Established in the year 2001, Athens Labs Ltd. is widely known to be one of leading Manufacturer of Pharmaceutical Capsules, Pharmaceutical Tablets, Pharmaceutical Syrup, Pharmaceutical Gel, Pharmaceutical Sachets, Pharmaceutical Injection, Nutraceutical Supplements, Pharmaceutical Suspension and Cream etc. We are Service provider of PCD Pharma Franchise, Pharma Franchise Opportunity, Pharma Franchise, Pharmaceutical Third Party Manufacturer, Pharmaceutical Distributors, Pharmaceutical Marketing Services. These are composed in compliance with the set industry norms by utilizing the finest quality ingredients. In addition to this, the offered array can be availed from us at nominal market prices. We are backed by an ultramodern infrastructural base that helps us in offering a commendable array of products as per the industry set standards. Our infrastructure is well-established with various sophisticated machines and most modern technology that allow us to develop the excellent quality of products as per the precise needs of customers. Due to this unit, we have been able to fulfill the diverse requirements of the clients, we provide these products in numerous packaging options. As a client-centric firm, we always try to satisfy our customers by delivering them their preferred products timely. Apart from this, these attributes have allowed us to build vast customer base all across the nation. Under the leadership of our mentor Mr. Rajneesh Setiya, we have managed to conquer several benchmarks of success in the market. His ability to understand ongoing market trends has been our most valuable asset to grow rapidly. 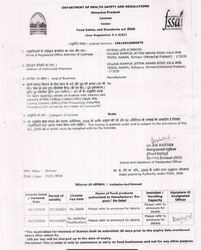 Certificate of Good Manufacturing Practices. We strive to provide customers with quality products that exceeds their expectations. We achieve this through our Quality Assurance program developed to ensure continuous validation and improvement in all areas of the manufacturing process.The depth of experience, capabilities, knowledge of our technical professionals and the advanced scientific analytical instruments assures that a world class quality of final product reaches our customers. We are backed by the sophisticated infrastructural base that helps us in offering a commendable array of pharmaceutical products as per the industry set standards. 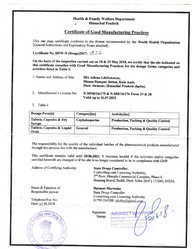 This unit comprises various sub-departments such as, sales, quality testing, designing, marketing, logistics, transportation, packaging, and warehousing. Due to this unit, we have been able to fulfill the diverse requirements of the clients; we provide these products in numerous packaging options. Empowered with a team of highly skilled professionals, we have been successful in holding a good share of the market due to the quality of our provided products. In order to keep pace with the latest market trends, we take full care to deliver the quality approved range in the market with the help of our professionals. Athens Labs Ltd. was Established in January 2001 and have a manufacturing Athens Life Sciences, (A WHO-GMP certified pharmaceutical company) A WHO-GMP & GLP certified organization, Athens provide the best quality products and cater wide market needs. We follow the best practices and all manufacturing regulations in our production. as a result of the dedicated efforts put in by a team of committed professionals with strong determination to serve Humanity. We strive to become a knowledge-driven Pharmaceutical company with the industry, work for highest level of operational excellence in all spheres of life. Our core endeavors are to add value to customers and maximize the strength of customer relationships. 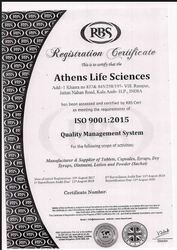 Athens Labs Ltd. since its incorporation has enhanced its competitive position in the pharma market through its approach. Athens Labs Ltd. is proud introducer of certain GMP certified Patent and Proprietary formulations. Athens Labs Ltd. has a powerful element of social responsibility inscribed in its' values and its' concern for the society beyond its' business motives. Athens Labs Ltd. operates in total compliance with the GMP norms set by the W.H.O., Customer satisfaction has always drawn CPL strategies and attitudes. Athens Labs Ltd. is an established & experienced company marketing finished formulations & Personal care products. It currently has a high workforce of dynamic persons. Athens Labs Ltd. is a dynamic & an optimistic player in the industry, having the vision to create a truly international Pharma company that would address complete Pharma needs. Athens Labs Ltd. is enjoying a very high reputation among the medical fraternity. An organization’s capabilities and intent are strongly reflected in the products it manufactures. In other words, the manufacturing competencies and facilities should by echo truly, the R & D extent and the ability to implement it for the best of the market it targets. Our various manufacturing partners. The aim here is to devise formulations and dosage forms for new drugs to be introduced and to make variants of particular dosage forms. Another objective is to introduce drug combinations by understanding the mechanism of the interaction and the combined effects in increasing the intensity of response, in decreasing untoward actions and in altering absorption. Athens Labs Ltd. is driven by its Vision to achieve significant business in proprietary prescription products with a strong presence in the pharma market. Athens Labs Ltd. is upon better health achievement through effective and safe medicines based on technological innovation. Achieving customer satisfaction is fundamental to our business. One of our key objectives has been to develop indigenous processes for new drugs introduced in the developed countries, produce and introduce them to lots of countries and promptly supply them to non-regulatory markets. We consider the protection of the environment as our primary responsibility. In this regard, all our processes and technologies are implemented to work in that direction. A clean and a green environment is an absolute necessity and we ensure this by using state-of-the-art Effluent Treatment Plant for all the waste generated. Our sprawling green campus houses a large percentage of our employees. We actively support and fund various environmental organizations in their crusade to make this place a better world to live in. Organization Mission is longer, healthier, happier lives. We dedicate ourselves to humanity's quest for longer, healthier, happier lives through innovation in pharmaceutical, healthcare, medicare, consumer and health products. Provide access to the best healthcare products at affordable prices. To provide access to the best healthcare products at affordable prices to everyone, present anywhere in the world. Athens Labs Ltd. mission is to dedicate itself to adding exceptional value through the creation of innovative medical products and services for the benefit of the medical community and human health around the world.